Turn part of your backyard into a woodpecker haven with help from the Heath Woodpecker Blend Suet Cake. This mix of almonds, peanut pieces, and wheat in rendered beef fat offers woodpeckers many of their favorite foods all at once, and will help birds maintain their energy. Its convenient size allows you to place it in a standard suet feeder, or rest one on a platform for birds and other animals to enjoy. For selective feeding, use an upside-down suet feeder for this unit. Invite woodpeckers to dine in your yard with this Woodpecker Blend Suet Cake. Made in the USA. 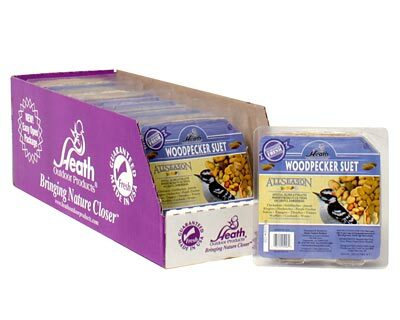 Note: This case pack includes 12 of the Heath Woodpecker Blend Suet Cakes.